We arrived at Santa Lucia Station around 6 pm, the sun was still up, warming the breeze blowing in the streets. Moving from the train station to Campo Santa Margherita, we stopped by “Bacareto da Lele”, which is directly in front of the German consulate, a must if you want to try the typical fried meatball with wine or spritz. Delighted by the meatball and satisfied for the good wine, we moved to Campo Santa Margherita, famous for its three cafès: one for students, one for tourists and one for venetians. Just before entering the square, we found out a small “Bacaro” called “Bakarò” where we took an “ombra”, a glass of good red wine, for just one euro. Ice cream was the perfect choice and Gelateria Il Doge the perfect place. It may go unnoticed if you don’t know it, but once you try “Crema del Doge”, its unique taste, it will become a must for your trip in Venice. Crema del Doge is a type of gelato made with egg cream, candied orange and chocolate. Trust me, there will be a party in your mouth. With gelato in our hands, we moved to Zattere (literally translated “raft”) area. 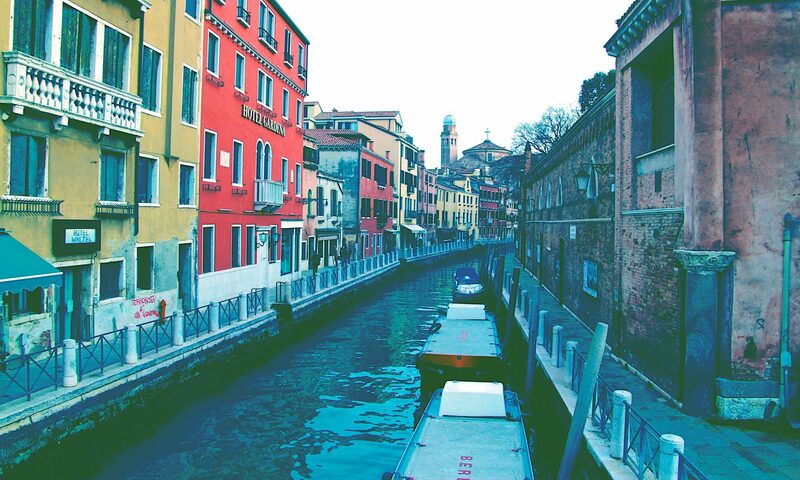 Zattere is a long walk flanking Canale della Giudecca, where some rafts are placed directly on the canal. A very known place on the Zattere is “Gelateria da Nico”, famous for its Gianduiotto (Gianduia chocolate ice cream) with whipped cream. Zattere is a good spot to enjoy the sunset, the Canal offers a wide open view on the sky and the water reflects the colours of the dying sun. It is a rare show. We stayed there more or less one hour, before moving to the next Bacaro. Turning in a narrow street, in front of a Squero (boatyard) for Gondola, we found Osteria Al Squero. The atmosphere was good as it was the wine, the calle was full of nice people and there were few gondolas passing by. After two-three drinks, we thought it was the time to eat something else. Coming back to the train station to pick-up a friend, we decided to eat at the Frito-Inn in Campo San Leonardo, a take-away restaurant offering fish fry and mozzarella in carrozza. The food was good and there is a lot of space to enjoy it with calm. Meanwhile night had fallen and Venice was a completely different city, it is surprising to see how it changes and how many faces this city has. Tired but happy, we chose two bacaros nearby, the “Paradiso Perduto” (literally Paradise Lost) and Vino Vero (True Wine). They are a little bit more expensive and choosy respect to those we went in the afternoon, but still good and affordable. We stayed there, sitting on the sidewalk flanking a canal until midnight, when we took the last train. All in all, it has been a wonderful experience, definitely worthy the 20-30 euro we spent. We managed to stay near the train station, avoiding the main crowds of Piazza San Marco and Rialto, enjoying other places and restaurants which are cheaper, but not for that less good, cool or magic than the expensive ones. If you find this story interesting, follow us on facebook, twitter, Instagram and on this site!! Please help us to make this blog better also by sharing your opinions or comments and if you are planning a trip to Venice, we will be more than happy to help you!